Based on a research project by HTK Intern, Christian Kaufman. A growing number of schools are making the switch from using artificial classroom lighting to using natural daylight to illuminate their spaces. This change creates significant benefits, most notably increased student productivity and significant energy savings. As studies unfold that display the positive effects of daylighting, many schools are exploring this option. Let’s take a closer look at some of these benefits. It should be no surprise that the sun improves our overall well-being, but can it improve grades as well? The strongest evidence of the positive effects derived from daylighting comes from a study conducted by the Heschong-Mahone Group (HMG) in 1999. This study shows that students in day-lit classrooms progressed faster and scored higher on tests than students with little to no daylighting. The study further shows that these improvements were universal among all grade levels. Limiting the amount of natural light in educational settings not only hinders the learning abilities of students but also increases health risks overtime. Research shows that children who don’t get the proper amount of daylight exposure are at risk for nearsightedness among other eye complications. Additionally, mental health and sleep can also be poorly effected by artificial lighting systems. Increasing the amount of natural light in school buildings, however, can significantly improve comprehension and decrease health risks. While schools are certainly interested in increasing overall student performance, schools are often challenged with tighter budgets and limited funding. 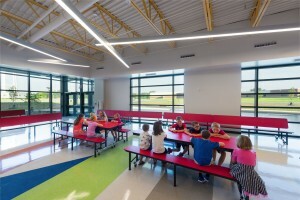 Studies have shown that optimizing daylighting for a project increases the project costs by an average of 2.5%; however, minimizing the use of electrical lighting results in an overall lower operating cost for schools and allows heating, ventilation and air conditioning to be downsized, thereby saving operation costs over time. This upfront cost can consequently be offset in the long run, often times ultimately proving to create lower long-term costs. It is no question that the benefits of daylighting outweigh the costs and being conscious about the design effort that goes into building or renovating schools should be inspired by the needs of the students. Schools that don’t use daylighting require larger mechanical systems that minimize window area and limit the amount of benefits that can come from natural light. Here at HTK, daylighting is a staple design technique for our educational clients, as we are excited about sustainability and the many benefits daylighting provides. We focus on designing environmentally responsible and aesthetically pleasing structures to maintain a lasting value and create a more productive and successful environment for all.